Stavros Zafiriu was born in 1958 in Thessaloniki (Greece). 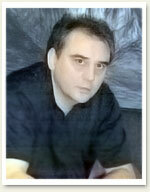 He is the author of twelve collections of poetry, one novel and three children’s books. He has also published poems, prose, critical essays and book reviews in the most important Greek literary magazines and journals. His poems are included in all the Greek anthologies of contemporary poetry and have been translated and published στις κυριότερες ευρωπαϊκές γλώσσες. Ειδικότερα, in French have been translated and published in L’ Harmattan editions his poetry’s collections Where to (2014) and his last book Difficult (2015). He has twice been nominated in Greece for the National Poetry Award (in 1998 and in 2013), while in 2013 he has been awarded the prize of the important literary criticism journal “O Anagnostis”, for his poetry book “Where to”. Né en 1958 à Thessalonique, Stavros Zaphiriou tient une place distincte dans la poésie grecque contemporaine, grâce à la particularité de son écriture. Il écrit également des livres pour enfants, des critiques et des textes théoriques sur la littérature. Nombreux de ses poèmes ont été traduits et publiés dans plusieurs langues européennes. Difficile (2014) est son recueil le plus récent. He has also published poetry and short stories in a large number of literary journals and reviews. Poems of his are included in many anthologies of Greek poetry. He was selected to participate in the 2 nd Biennale of Young artists of the Mediterranean European countries (1986). His play The Animal Carnival ( Το Καρναβάλι των Ζώων ), illustrated by Takis Tsentema ϊ dis, has been awarded the Prize of the " Children Book Circle " and is permanently exhibited in the Typography Museum in Offenbach .